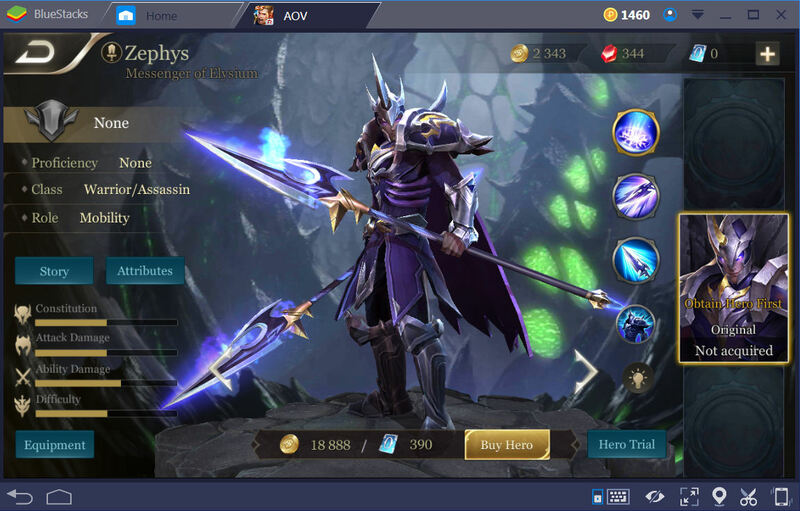 Arena of Valor is Garena’s very first mobile MOBA offering and we can comfortably say that it’s no slouch on the features or fun. Especially if you happen to be a fan of DC Comics!! 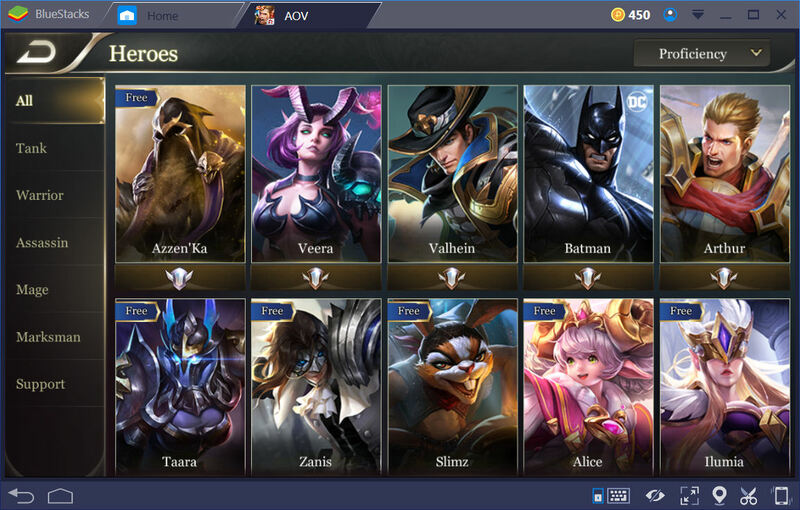 Yes, in Arena of Valor you can play as Batman, The Joker, Superman, or Wonder Woman. The interesting part is that there are certain features in the game that you won’t find in other MOBAs. For example, the 1v1 match against an AI opponent. Such a match type has a couple of benefits. To make things more interesting, the game works great while playing it in Bluestacks. There’s a lot to this game so this guide will go over the various aspects of the game in detail. You’ll be controlling all the setups and various other aspects of the game from here. Starting in the top left corner, that’s the account information screens. You’d see it as your profile picture from Facebook. You’ll find various settings and details about your account in here. DO PAY ATTENTION to your Credibility Score. The part you want to pay the most attention to is showing in the middle and the upper right area of this screen. Garena takes this stuff VERY SERIOUSLY. It’s to the point where while checking things, I received a message about another player that was reported as being AFK during a match who was teamed with me. 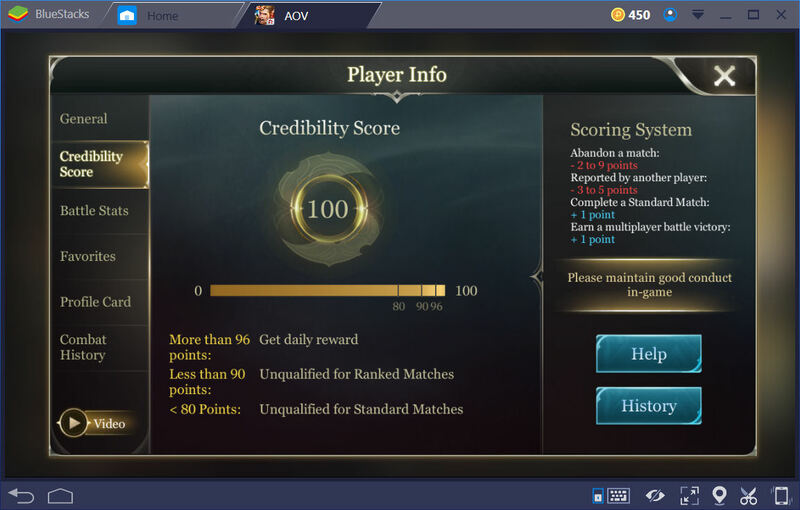 Apparently that player has a lower Credibility Score and was temporarily banned according to the message. So don’t say you were not warned!! Whenever you see red colored dots (with or without numbers) on the screen, it means you have something to collect or there’s a notification about some part of the game. So check them as soon as you find them. From the top middle to the top right corner you’ll see the in game currencies. Use them WISELY. Next is the Settings button. As you can see on the left side, you can setup various options to your liking. See about raising or lowering settings to improve game performance if needed. Next is the Wi-Fi icon. That’s another one to pay very close attention to. If that turns red, click on it to check it. IF you have a high enough ping, there’s a chance the game won’t let you enter into certain matches. IT IS for your own good that the game has this feature. You don’t have to worry about the battery icon since this is all on Bluestacks! From the top to bottom on the left of the main screen you start with the Shops. 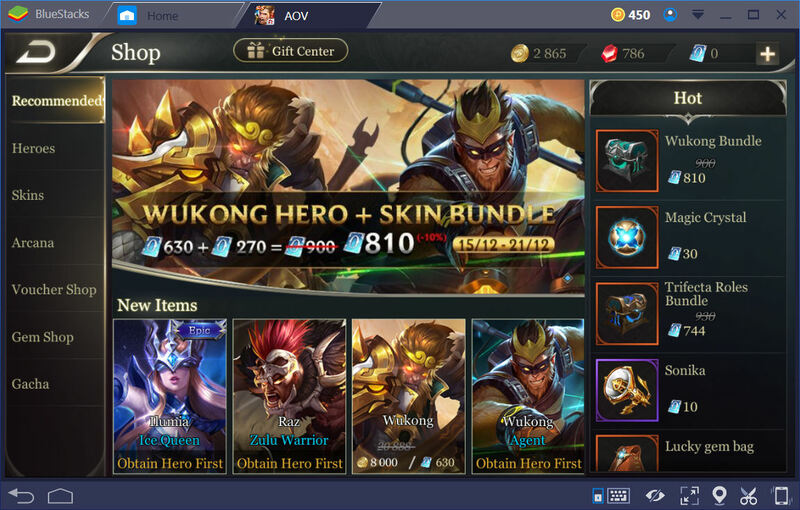 When you first start playing Arena of Valor, and many other games, it’s pretty easy to be tempted to spend like crazy. The recommendation is to control that urge!! At least long enough to make sure you’ve checked rewards from any events and the tutorials and the Road to Glory. There’s no sense in buying a hero if you’re just going to get it for free later!! As showing in the above screen shot, getting gems isn’t hard at all. The Gem Shop has various goodies for you to try out. Again, don’t go hog wild because the red gems are not THAT easy to get!! Next is the heroes’ screen where you can check out and even buy heroes. The heroes that you own will be showing first and sorted initially by the Proficiency. The drop down list box showing that has a few other sorting options. When you’re checking out a particular hero, there’s a button to try out the hero in Practice Mode. That Practice Mode is a pretty decent way to try out that hero. You won’t gain anything beyond knowing how the specific hero skills work. IF you don’t own a hero, this is your only method to try before you buy. 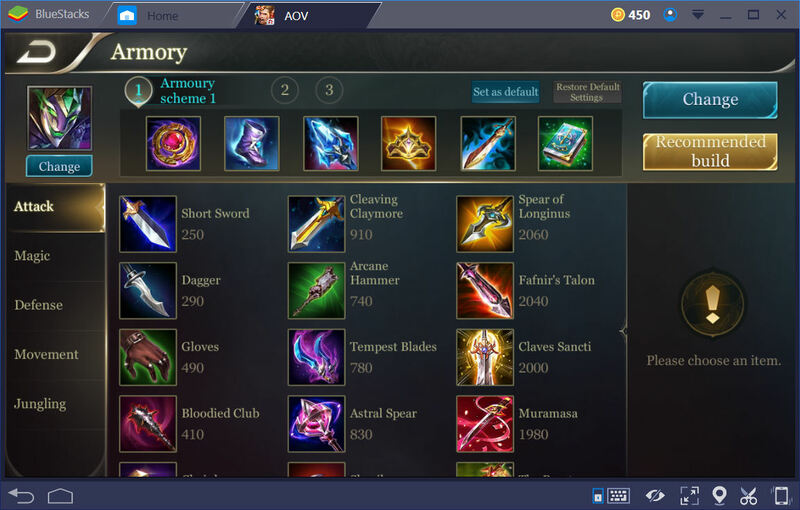 The next option down the line in the main screen is the Armory. This will allow you to setup your heroes’ equipment on a 1 by 1 basis. You can setup equipment for heroes you both own and don’t own. The Talents are the second part of the Armory. These are additional skills which are unlocked as you level. Once the Talent is set, you simply click the back button and it becomes the default. You can change your Talents directly before a match starts. Even though it’s not showing in the main screen shot above, the next option is the Arcana. Arcana are coin type items you gain as rewards or you can buy them. They’re boosts for your heroes. They are color coded as red = attacks, purple = HP purposes, and green = defenses. The Recommended tab shows recommended Arcana setups for each hero. You can have several pages of Arcana all setup to use and switch between before a match starts. You unlock more and more Arcana slots to use when you level up your account. Next you have the Backpack which is your inventory. You’ll find all the items you’ve gained while playing. It’s pretty straightforward stuff!! The last part is the Guild section. The Guild section offers you a way to either join a guild or make one. 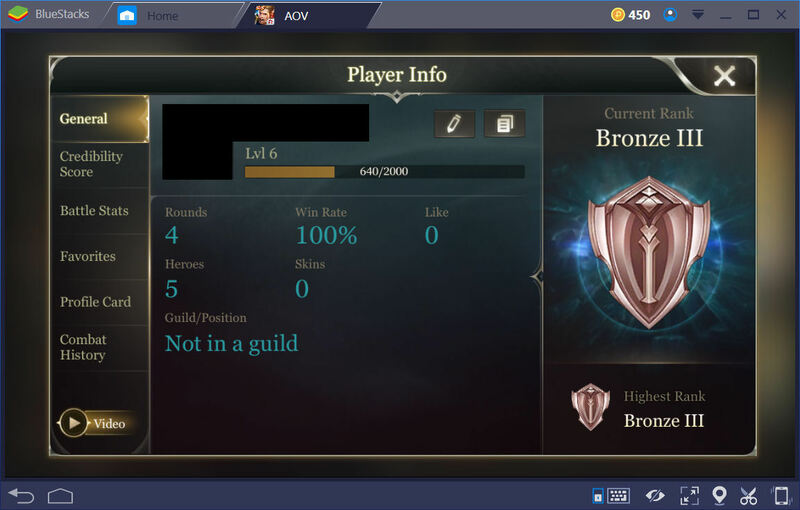 As showing in the above screen shot, there’re various details about each guild. 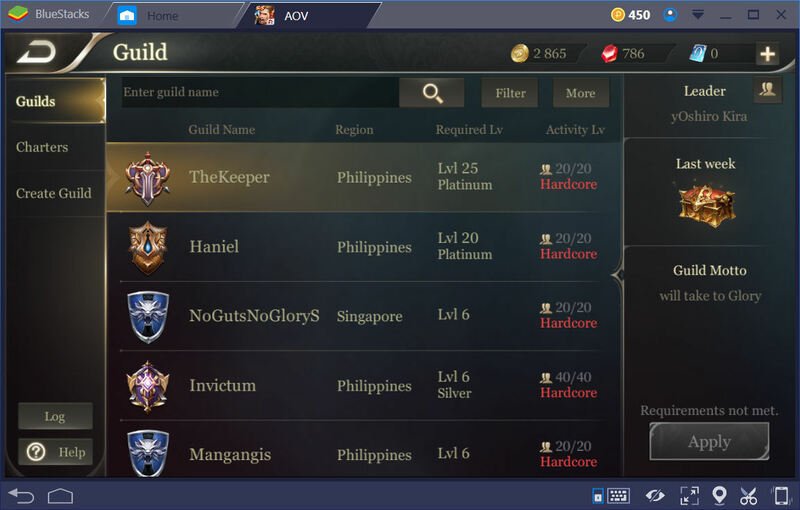 If the particular guild you have highlighted is not full, you can click the Apply button in the bottom right corner. The recommendation is to join a guild when you’re first starting out. At the bottom right of the main screen shot far above, you’ll see those little red dots that were mentioned previously. They appear in the bottom right of the main screen often. In the middle of the main screen is where all your action is going to happen. There’s a wide variety of match setups found in here. As mentioned above, you can also setup a 1v1 match against an AI opponent. The benefits are that you DO gain gold and EXP from these types of matches. The other benefit is that it’s much better practice with a new hero than the Practice Mode. It’s exactly as the name implies. If you want to get to the top of the rankings, you’ll have to play ranked matches. Be warned, many players take these matches very seriously. So if you “misbehave” as mentioned in the Credibility Score above, don’t act surprised when your penalties start racking up. Again, it’s as the name implies. The Practice Mode is found in here as well as the Tutorial Mode and Guide. The Guide is not so info packed. But at least it tries to tempt you into buying things in the Shops!! Do yourself a favor and complete the Tutorial Mode as soon as you can. The rewards are not bad at all!! This is a reward system based on the number of times you play. Do yourself a favor and check it!! Notice the middle right side of the screen shot. See the bluish coloring?!! It means there’s more than those 3 heroes are your rewards. Swipe it to the left and right to see the rest of the rewards. 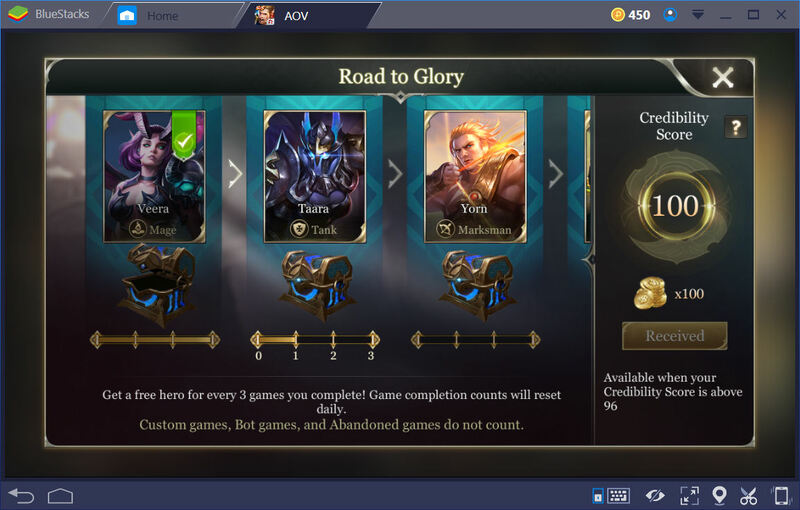 Do make note of the game modes listed at the bottom of the Road to Glory screen. Why play this using Bluestacks? 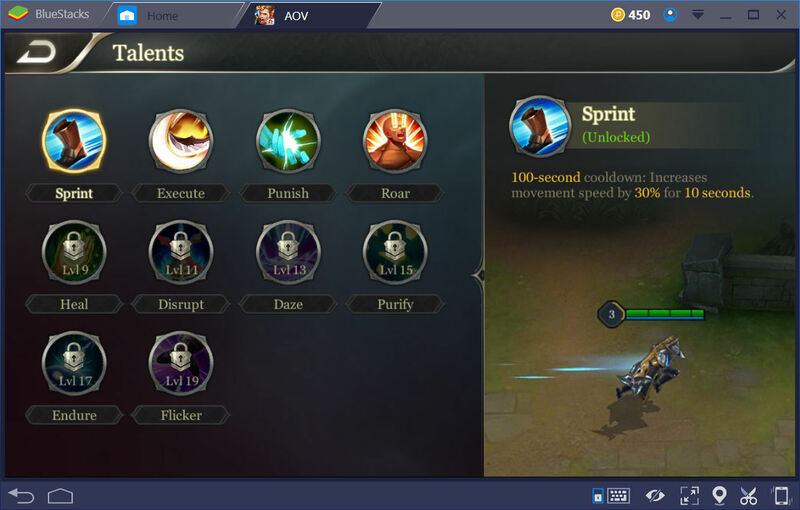 Bluestacks offers 2 help methods for Arena of Valor players. These are the Key Map setup and the MOBA mode. A key map is a way for an emulator to simulate taps on the screen of a mobile device using your keyboard. 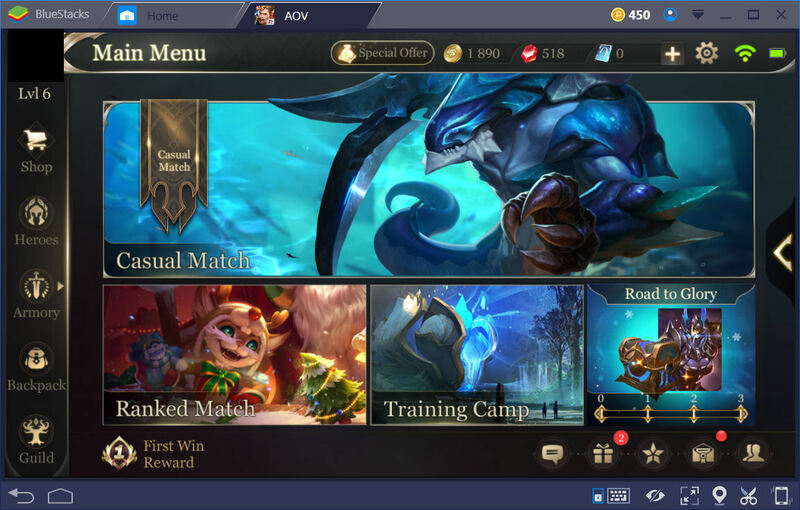 Bluestacks has a key map already configured and ready to use for Arena of Valor. 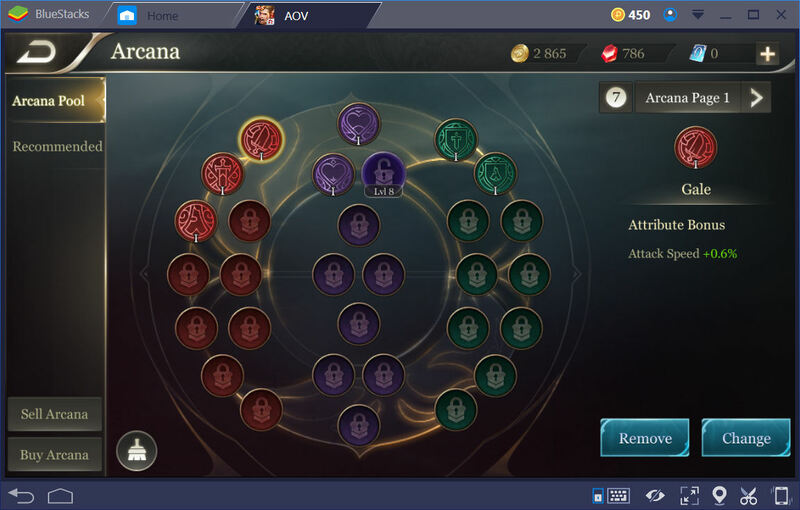 Take a look at the screen shot above showing the default key map for Arena of Valor. Don’t worry about Batman!! When playing the game, if you press Q on your keyboard, your heroes’ first skill is activated. If you press the space bar on your keyboard, the heroes’ basic attack is activated. The numbers 1 to 3 are pressed to increase a skill’s level. The fun part is that you can change this all you like. You can add in simulated screen taps by simply clicking somewhere. You can remove the defaults or anything you place by clicking the X next to each tap spot you’ve placed or moved. When you’re happy with the key map setup, don’t forget to click the Save button!! The real benefit is when a player is using a gaming mouse and/or keyboard. Those things are built to be highly responsive. That’s what you’d want while playing. 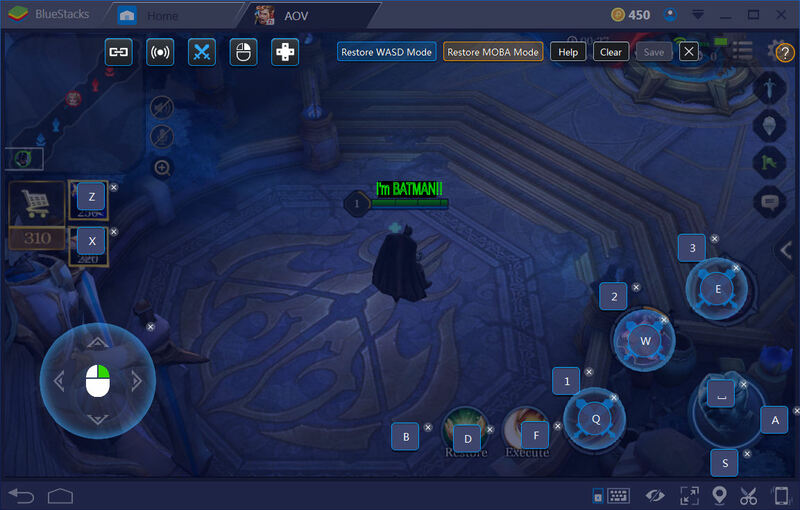 The MOBA mode allows for the use of the mouse to simulate PC MOBA style playing in Bluestacks. 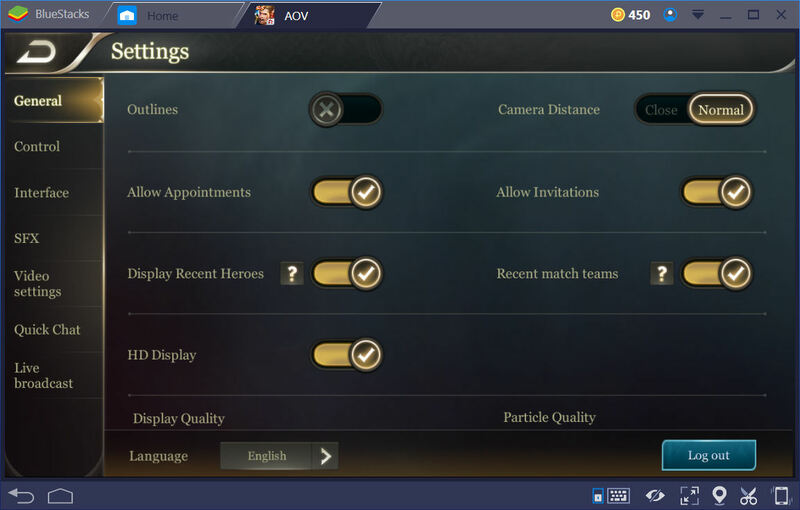 So those players which are very used to playing games like DOTA and/or LoL should have zero problems playing Arena of Valor on PC using Bluestacks. 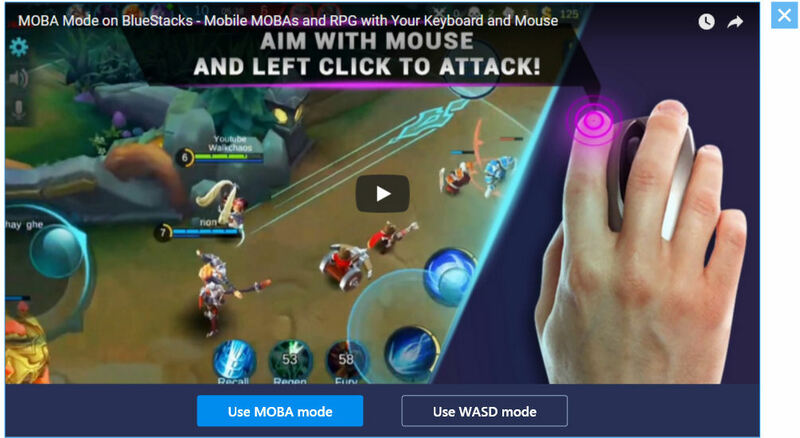 When you start the game in Bluestacks, you’ll be offered a choice of either MOBA mode or WASD mode. Pick whichever one you’re most comfortable with. To make sure, try them both when you get the chance!! 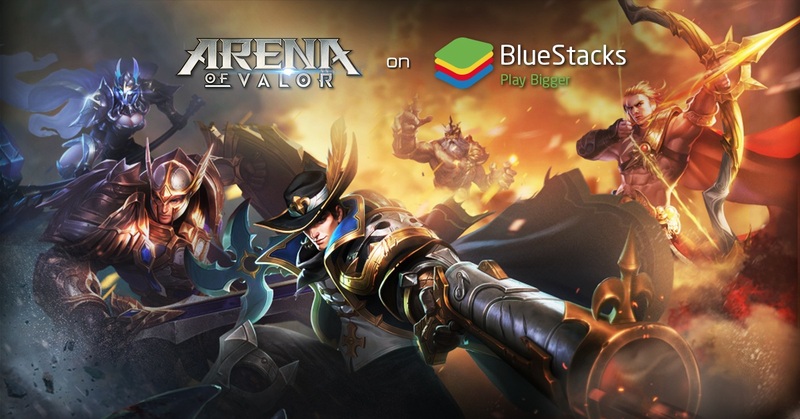 Download Garena AOV: Arena of Valor on Bluestacks Now!